We don’t want to sound greedy. Sure we’d love turtle doves and lords a leaping, but let’s face it, we’re machine enthusiasts here over at Utility Contractor. 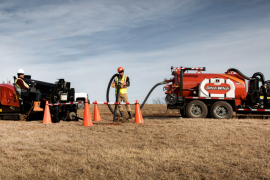 The past year has brought some great products to the marketplace and we’ve had our eyes on quite a few that would be ideal for utility and excavation contractors. We don’t want to sound greedy. Sure we’d love turtle doves and lords a leaping, but let’s face it, we’re machine enthusiasts here over at Utility Contractor. 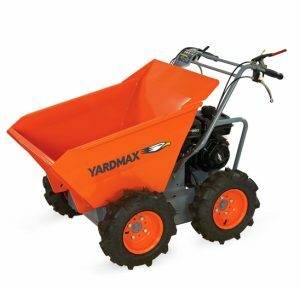 The past year has brought some great products to the marketplace and we’ve had our eyes on quite a few that would be ideal for utility and excavation contractors. Over the next several pages, we highlight 12 innovations and celebrate the manufacturers who took risks and rewarded their customers with machines and technologies unlike anything they’ve seen before. And just to put it out there: Everyone on our staff would probably make the nice list, so don’t hesitate to put in a good word for us. If one of these products ended up under our tree, you wouldn’t hear us complaining. When the drilling gets tough, the Ditch Witch JT60 All Terrain gets drilling. With its 60,000 lbs of thrust and pullback and 9,000 ft-lbs of rotational torque, the JT60 All Terrain horizontal directional drill gives operators the flexibility of a smaller footprint drill without losing power. The machine’s patented two-pipe drilling system gives more power to the bit than any other rock-drilling system in its class, says the company. Thanks to an advanced inner-rod design, the patented technology enables the JT60 All Terrain to be more productive in the widest range of ground formations. The simple customer-driven design features a fully enclosed, climate-controlled cab with a conveniently positioned instrument panel. In addition, the intuitive carve mode reduces operator fatigue. The JT60 All Terrain comes factory-equipped with the proven Ditch Witch GPS offering at no additional charge so users can remotely view performance criteria while gaining awareness into operator practices, idle time and service needs. For more information, visit www.ditchwitch.com. Just edging its way in for 2014, Komatsu America unveiled its PC210LCi-10 intelligent Machine Control hydraulic excavator to the North American market in November. The new unit features Komatsu’s machine control and guidance technologies, built upon the successful foundation of the standard Komatsu PC210LC-10 excavator. Thanks to the exclusive control function, the PC210LCi-10 goes beyond simple guidance to semi-automatically limit over-excavation and trace a target surface. From rough digging to finish grading, the PC210LCi-10 excavator offers improved efficiency and accuracy over traditional methods. With an operating weight of 52,036 lbs and a net horsepower of 158 hp, the PC210LCi-10 is powered by a Komatsu SAA6D107E-2 engine and is EPA Tier 4 Interim and EU Stage 3B emissions certified. The bucket is semi-automatically limited from digging beyond the target surface. The control function also semi-automatically follows the design surface allowing for accurate finish grading, with real-time bucket edge positioning in relation to the machine and the job surface. 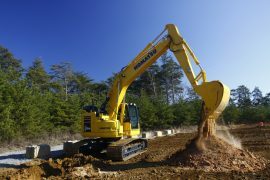 For more information, visit www.komatsuamerica.com. Sure there was Godzilla and Guardians of the Galaxy, but Doosan Portable Power had the real summer blockbuster this year. In June, the company introduced its new rugged and reliable line of generators — the NG160, NG225 and NG295 — designed to run on wellhead natural gas and propane to ensure continuous operation in remote locations. The three models are equipped with the innovative and patent-pending Onboard Scrubber System that removes excess dirt and water from the wellhead gas. These natural gas generators are also equipped with an automatic dual-fuel switch, allowing the generator to operate on propane, as well as natural gas. This ensures continuous generator operation in the event that wellhead gas flow is interrupted or unavailable. Generator diagnostics and uptime are also supported by a telematics system that allows fleet and service managers to remotely observe machine use and performance in secluded or difficult-to-monitor locations. For more information, visit www.doosanportablepower.com. Plenty of new products flooded the show floor at this year’s CONEXPO-CON/AGG, but Wacker Neuson’s new 803 Dual Power mini excavator certainly made a splash. 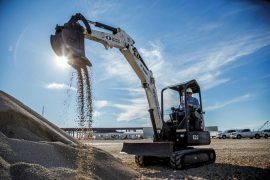 The innovative 1-ton excavator runs off a standard diesel engine or can easily be connected to an electro-hydraulic pump, allowing the machine to operate emissions-free. 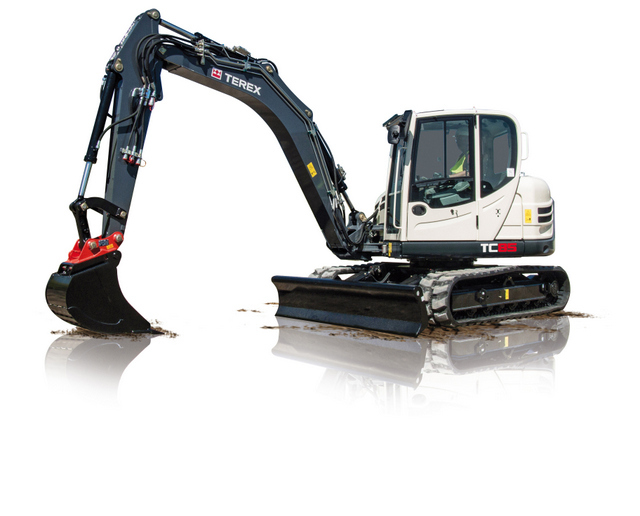 The new 803 Dual Power features a dedicated connection in the undercarriage where the electro-hydraulic pump, HPU8, attaches to the excavator. 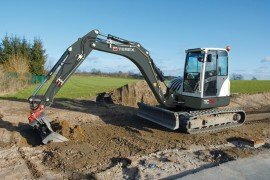 For convenience, long 12-meter hoses connect the HPU8 and the 803 undercarriage, allowing the mini excavator to still rotate 360 degrees. Accessibility on the job is easy since it is narrow enough to fit through standard interior doors. In the conventional operation, the 803 is powered by a proven 13-hp diesel engine, which provides the small excavator enough power for breaking applications. When connected to the HPU8 pump, the 803 runs emissions-free with the same best-in-class performance. The dual power system requires 480V, three-phase, 30-amp electricity. For more information, visit www.wackerneuson.us. Up until late this year, Kobelco only offered its revolutionary Integrated Noise and Dust Reduction Cooling System (iNDr) on larger excavators, but in September that all changed. The company launched its newly enhanced SK35SR mini excavator with the exclusive cooling system technology — making it the first of its kind. In contrast to conventional cooling systems (which use a large fan to cool the engine), iNDr technology creates a high-tech “wind pathway” through the use of an enclosed duct. Sound waves are forced to reflect off the many surfaces of this ingeniously engineered “wind pathway.” In turn, noise is significantly reduced while the filter acts as a mask to reduce dust. The SK35SR not only adopts this state-of-the-art iNDr cooling system, but also incorporates the iNDr technology into its own exclusive, one-of-a-kind cooling system — the dual arrangement, iNDr and eco-friendly system (iNDr+E). The iNDr+E system differs by directing the muffler exhaust underneath the machine for environmental protection. For more information, visit www.kobelco-usa.com. There are plenty of bright ideas in John Deere’s E-Series skid steers. The E-Series medium size models provide enhanced uptime, productivity and low daily operating cost features for Deere customers. First off, Deere is the only manufacturer that offers an option that allows an operator to switch between all three industry control patterns of operation in one machine. With the EH Switchable Controls option, operators can choose from using foot pedals to control loader and bucket operations, or switch to ISO pattern controls (drive with left joystick, loader/bucket with right joystick) or choose H pattern mode (drive with right and left joysticks fore/aft and loader control with left joysticks/bucket with the right joystick in and out). The exclusive EH Joystick Performance package option allows the operator to adjust loader and bucket speeds, adjust propel speeds for drive sensitivity and set creeper mode to match maximum travel speed to the production of an attachment. 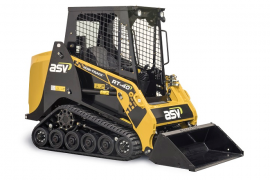 An exclusive reversing engine and hydraulic cooling fan will automatically reverse to clean out debris from the radiator at periodic intervals. For more information, visit www.deere.com. Tight worksite? No problem! The new Cat 335F L CR excavator is made for heavy work on congested jobsites. Equipped with 33-in. track shoes, the 335F L CR limits over-the-side tail swing to just 7 in., and a heavy counterweight enhances overall stability and provides lift capacities up to 41,500 lbs. The compact radius excavator delivers a 16 percent improvement in fuel efficiency compared to the 328D model it replaces. With efficient hydraulics, heavy-duty structures, a quiet and comfortable full-size cab, high-ambient cooling system, ground-level service points and a range of work tools, the 335F L CR is one well-built, versatile machine for demanding work needs. The 192-hp C7.1 engine meets strict U.S EPA Tier 4 Final emissions regulations without interrupting the operator or the job. Proven electronic, fuel, air and aftertreatment components like a maintenance-free diesel particulate filter ensure customer expectations for productivity, fuel efficiency, reliability and service life are met. For more information, visit www.cat.com. When manufacturers “update” their product lines, it’s typical to expect a handful of upgrades. But, nope, that wasn’t good enough for Terex. In September, the company introduced its new line of skid steer loaders and compact track loaders, the new Terex Generation 2 (GEN2) loaders, featuring more than 100 enhancements from the previous models and are available in radial- and vertical-lift path patterns with rated operating capacities (ROC) ranging from 665 to 3,600 lbs. The Terex GEN2 loader lines are aimed at increasing machine performance through additional ROC and loader breakout forces, while increasing the machine’s durability and reliability in the field. All Terex GEN2 models are equipped with Tier 4 Final engines for increased productivity at a lower operating cost. Other improvements were made based on customer and distributor feedback and warranty data. Some examples include: an improved quick-attach pin profile; a cylinder seal package that includes three additional sealing surfaces; and so much more. 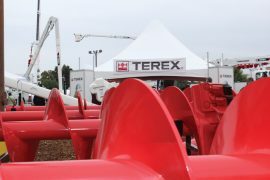 For more information, visit www.terex.com/construction. Versatility and productivity are no-brainers when selecting new equipment, and The Toro Co. achieved both in its innovative RT1200 riding trencher. The Toro RT1200 offers a number of unique features to meet the needs of utility contractors. Built on a tool carrier chassis, its design is extremely versatile to allow contractors to select from tracks or tires and a variety of attachments — including a backhoe, six-way backfill blade, rocksaw, vibratory plow, reel carrier and the Toro-exclusive Heavy-Duty (HD) trencher drive. The Toro HD trencher drive consists of three major components: a flywheel, torsion shaft and planetary gearset. The flywheel stores inertial energy, ensures efficient hydraulic system operation and keeps the chain consistently running in tough digging conditions; the torsion shaft absorbs shock loads; and the planetary gearset multiplies the hydrostatic motor torque for added digging power. Added up, the HD trencher drive technology ensures consistent, powerful trenching performance in the most demanding digging conditions. For more information, visit www.toro.com. There’s always room for improvement and Case kept that sentiment to heart when it introduced four new models — the 21F, 121F, 221F and 321F — to its F Series line of compact wheel loaders. These machines have been completely redesigned to provide improved maneuverability, versatility and performance. The new F Series compact wheel loaders offer a more compact design while simultaneously increasing breakout force and lift capacity compared to previous models. With a 4- to 6-in. shorter wheelbase, the new F Series compact wheel loaders provide a smaller turn-radius for greater maneuverability. The new models also feature a lower cab height — up to 13 in. — which, combined with the smaller footprint, makes these new models easier to load and transport. The F Series compact wheel loaders feature exclusive new electronic controls for boom and bucket functionality that provide increased precision and reduced operator fatigue compared to mechanical controls. For more information, visit www.casece.com. There’s plenty to worry about out on the jobsite. Recording equipment info back in the office shouldn’t be one of them. Equipment Field Entry is a Dexter + Chaney mobile app that lets you record meter readings and fuel transactions for your construction equipment and stay on top of equipment maintenance without leaving the jobsite. A perfect complement to telematics data, Equipment Field Entry helps ensure that your construction equipment information is accurate and up-to-date, helps you keep your machines operating at peak efficiency and helps create a clear picture of actual equipment costs. 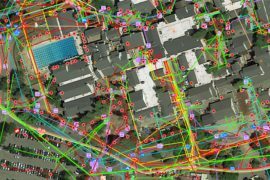 The app lets supervisors confirm the machines assigned to their jobs and track the location of all equipment available to them. This helps ensure that the equipment you need is ready to go when and where you need it, and that equipment costs are accurately reflected in your job costs. For more information, visit www.dexterchaney.com.